Great location with fabulous views from balcony. Friendly owner. Excellent location and hospitality. Would love to come back. The owner very friendly and willing to make your stay as nice as possible. Super clean rooms wand great kitchen facilities. Happy customer. Amazing sea view . The apartment was cleaned every day . It was well located, close to restaurants and city center. The hosts were nice. We had a beautiful, spacious and clean studio with mosquito nets on all windows and doors, which was a huge unexpected bonus for me, a comfortable bed and plenty of kitchen equipment if needed. The owner is very friendly and helpful, giving us a map of the town and pointing out interesting things to do. The location of the property is ideal, just a ten minute gentle stroll into town but there's plenty of cafe's etc. close by too. Our room was like a complete small home.. We had a bed, a sofa, a table, small kitchen, bathroom and a small terrace with view to the sea. Plenty of space inside, mosquito nets, curtains, a floor fan and also AC. Also, we found parking for the car close by (we could see the car from the window) and it was legal and free. Another wonderful stay at Perla apartments. As usual, Poppi was very welcoming, helpful and accommodating. Wonderful location adding to a truly relaxing break. Fabulous! Thank you Poppi! Perfect location!! Excellent hosts, very clean apartment with an amazing view. Would highly highly recommend. It is very close to the centre of town and the beaches. The staff were very friendly and it was really clean. Lock in a great price for Perla Apartments – rated 9.1 by recent guests! One of our best sellers in Agios Nikolaos! Overlooking the gulf of Mirabello, on the coastal road of Agios Nikolaos, Perla Apartments offers rooms with kitchenette and free Wi-Fi. Within walking distance, guests can reach the center of Agios Nikolaos town. In the town of Agios Nikolaos, guests can find many taverns and seaside cafes, while a cafe and a mini market are featured next to the property. The picturesque fishing village of Plaka is located a 20-minute drive away. Free parking is available near the premises. When would you like to stay at Perla Apartments? Featuring Cretan Sea views, this air-conditioned studio opens to a balcony. It has a kitchenette with a mini fridge and cooking hobs and a smart, satellite TV. Free Wi-Fi is available. Featuring a seating area, this air-conditioned, 1-bedroom apartment opens to a balcony with Cretan Sea views. It has a kitchenette with a mini fridge and cooking hobs and a smart, satellite TV. Free Wi-Fi is available. Featuring a seating area, this air-conditioned, 1-bedroom apartment opens to a balcony with partial Cretan Sea views. It has a kitchenette with a mini fridge and cooking hobs and a smart, satellite TV. Free Wi-Fi is available. This apartment has a electric kettle, balcony and kitchenette. House Rules Perla Apartments takes special requests – add in the next step! Perla Apartments accepts these cards and reserves the right to temporarily hold an amount prior to arrival. Please let Perla Apartments know your expected arrival time. Please inform Perla Apartments of your expected arrival time in advance. You can use the Special Requests box when booking, or contact the property directly using the contact details in your confirmation. Road below was noisy at times . Barking dog on balcony below was annoying, when the owner was out ! The water is limited. I have finished my shower with cold water every day . In October it isn’t comfortable at all . It wasn't easy to find a parking place. It was noisy, the main street its very close and you had to close the window so you can sleep. Room was very hot in September. We had to use the AC often but the unit was mounted above the bed. So during the night it would really bother us because the AC air was hitting us, but if we stopped it would get hot really fast in the room. So the sleep was not really comfortable for us. The shower could have been better, but it’s not a complaint just a small criticism. I have visited Agios nikolaos a few times. I would not stay any where else. 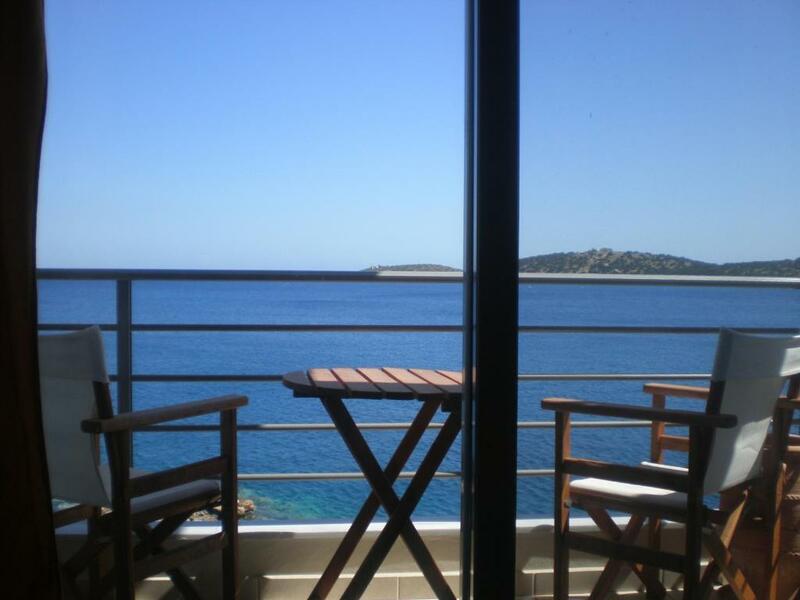 The location is perfect, the apartment overlooks the beautiful beach with crystal clear water. Apartments are generous in size. The balcony's are large having breakfest or a late snack overlooking that view is something that will never leave you. The owner Popi keeps the apartments very clean, she is very helpful, and can assist you in finding best restaurants places to visit etc. Overall was a 10 out of 10 place to stay. Nothing it was very nice. Have no complaints. Everything. All was as expected. Popi was very nice host. Will return again.